In our regular Street Spots feature we’ll be putting on show some of London’s coolest street scenery and telling its story. We’ll snap it, and Google map it, so you can get down there in person and check it out. If you’re out and about and spot something worth snapping on the Capital’s streets take a shot, or even a selfie, and send it in to us. We’ll talk about it here or paste it up on our social feeds. For our first Spot, we focus in on some seriously famous street art. Once this was a dark part of town. It was a place where the Ripper prowled, criminal gangs like the Crays held power and where you might expect to find the blood of their victims on its soot stained walls. 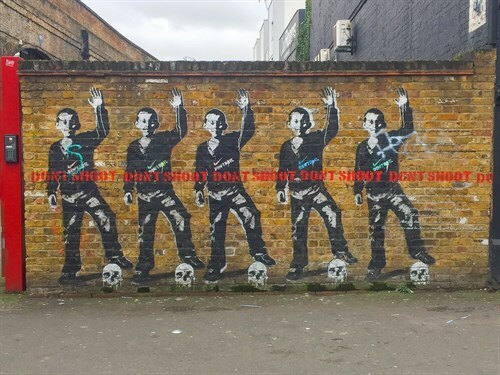 Nowadays though Shoreditch is one of the most vibrant parts of London, where blood and soot has been replaced by cutting edge street art and where it is the Hipsters doing the prowling among the bars, cafes and tattoo parlours of London’s trendiest district. For spotting street art around here you can’t beat Rivington Street, where almost every bare patch of brickwork seems to have been claimed by the spray can or paint brush of a famous guerrilla artist. There’s a work by legend Thierry Noir, a bunch by Brazilian artist Cranio, and down at the Shoreditch High Street end – in the courtyard of Cargo nightclub – there are even two works by the most famous of them all, Banksy. But our Street Spot is of an altogether rarer artist for the East side of town. To view this you don’t need to go far from the Banksy pair in Cargo courtyard. Just turn around 180 degrees to face the wall opposite and you’ll see this mural by the North London artist Bambi. Bambi has been named the female Banksy and like him she has remained anonymous. She hit the street art scene in 2011 with an Amy Winehouse portrait in Camden Town and has since become nearly as famous as Banksy himself. Bambi usually paints celebrity subjects and is less political than her male counterpart, which makes our Street Spot all the more rare. The ‘Don’t Do It’ logo in the work is a clear subversion of a Nike advertisement’s ‘Just Do It’ and the painting is a comment on the controversial police shooting of Michael Brown in Missouri USA in 2014. These days Bambi’s works go for big money, with ‘A’ listers such as Brad Pitt, Robbie Williams and Adele paying thousands of pounds for a piece. But if you get yourself down to Rivington Street you can see this one absolutely free of charge anytime of the day or night!